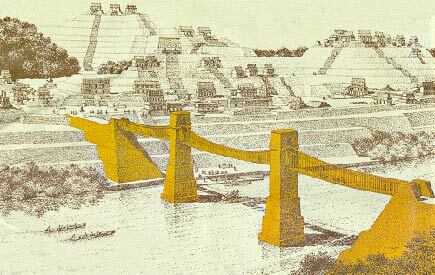 A fellow named James O’Kon claims that the Maya built the longest bridge span in the ancient world. His theory is based on computer reconstructions derived from a 12-foot high and 35-foot diameter rock formation in the Usamacinta River near the site of Yaxchilan, which flourished between 500 and 700. A similar second structure was discovered in 1992. O’Kon, who is former chairman of the forensic council of the American Society of Civil Engineers, enlisted the services of his Atlanta engineering firm to create a reconstruction of the bridge. To my eye the bridge does not look consistent with known Maya architecture. The full story is at the Georgia Tech Alumni website, which is also the source of the image shown above. This is incredible. If this did exist, this should be in most Maya books of anthropology and archaeology.